Do you have a poorly located tree? There's no need to chop it down! With the right tools and techniques, you can transplant a tree to another area in your yard. Whether they’re deciduous or evergreen, shade or ornamental, trees add value and curb appeal to any property. But, occasionally, a tree’s placement presents some problems. Perhaps it blocks a construction project like a home expansion or a deck addition. Maybe the tree is floundering from inadequate light, soil, or water conditions in its current location. A tree may also start growing too close to the house or surrounding landscaping, preventing healthy development. Whatever the situation, that poorly positioned tree doesn’t have to get you down or get chopped down. As long as the healthy sapling’s tree trunk isn’t larger than three inches in diameter, a homeowner can follow this guide for how to transplant a tree to another spot in the yard. If you’re considering how to transplant a tree within your property, be sure to time it right: Trees should be moved during late fall or early spring, since the tree’s dormant state allows for speedy root growth in the new location. If transplanting in the fall, complete the task early enough for the roots to get established before the ground freezes. 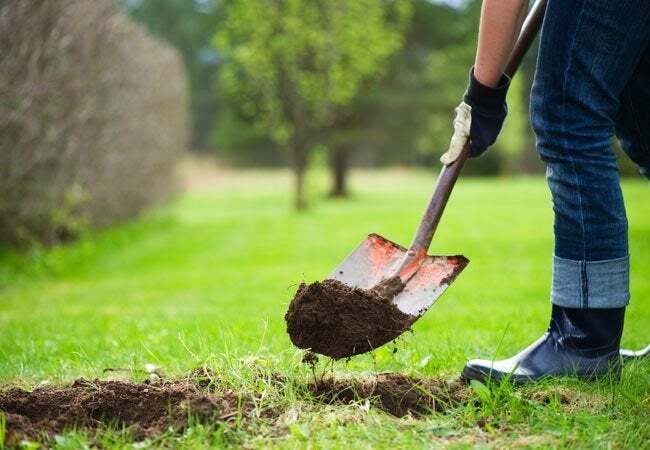 Even so, you should start your project much sooner than that; tree roots must be pruned several months prior to the transplant in order to help the tree thrive in its new location. Keep reading for instructions on how to prune as well as how to transplant your tree—and how to ensure it survives in its new home. The process of transplanting a tree actually begins several months prior to the actual relocation with the pruning of its roots. This act encourages the growth of new feeder roots (which absorb water and nutrients) closer to the tree’s base to help the tree better adapt to its new location. If you’re planning to transplant a tree in the fall, then prune roots the previous spring. If you’re planning to transplant a tree in the spring, then prune roots the previous fall. To properly prepare the tree for pruning, water it well the day before. Watering helps ensure the soil sticks to the roots, and moist soil is easier to dig into. Calculate how much of the root ball—the cluster of roots at the base of your tree—you intend to prune. As a general rule of thumb, the root ball should be about one foot in diameter for every inch of trunk thickness. So, if the trunk is two inches thick, you’ll aim to prune the root ball to be two feet in diameter. Note: If your tree’s trunk spans more than three inches in diameter, its root ball will be too heavy and fragile for a do-it-yourself landscaping job. Instead, call a professional to see about having this larger tree transplanted. Cut a trench (about two feet deep and at least one foot wide) around the root ball with a flat spade, making sure to cut through the existing roots that extend past this circumference using the sharp edge of the spade. Refill the trench with the uplifted soil, carefully placing subsoil underneath topsoil. When you return in two seasons for the move, you should find new feeder roots growing closer to the tree trunk and creating a strong root system. After roots are pruned, homeowners should give the tree several months to establish a new root system. Ensure the tree is healthy before removing it from the ground, since a sick or damaged plant likely won’t survive relocation. If the tree isn’t thriving (whether from disease or environmental issues), you may need to hold off until it becomes healthy again. Also, as an added measure of safety, make sure you aren’t digging near any underground utility lines during the course of the project. Choose a new location carefully. Make sure the new spot has sufficient space for the tree to grow, as well as proper soil, light, and water conditions. Every type of tree has different requirements, so take the time to do your research. Water the tree’s soil one day before transplanting. Moist soil is easier to dig and helps maintain the cohesiveness of the root ball. In the new location, dig a hole that’s about three times as wide yet the same depth as the root ball, in order to give the lateral roots room to spread out. You won’t want to dig a hole too deep, or else rotting of the roots may occur. Take care to save the soil, separating the topsoil from the subsoil. Water the hole well to infuse some extra moisture into the soil, which will help hold the root ball together. Using a shovel, remove the topsoil near the trunk and roots of the tree. Then start digging around the tree with a sharp, flat spade about six inches further than the pruned roots. Digging several inches past the trench ensures that you include most (if not all) of the new feeder roots that will help the tree adjust to its new location. If you come across any older, stubborn roots in the path of your digging that you missed while digging the trench months ago, cut them with pruning shears or—in the case of larger roots—loppers. After digging all the way around the circumference of the tree, start to dig under the tree to sever the roots beneath. 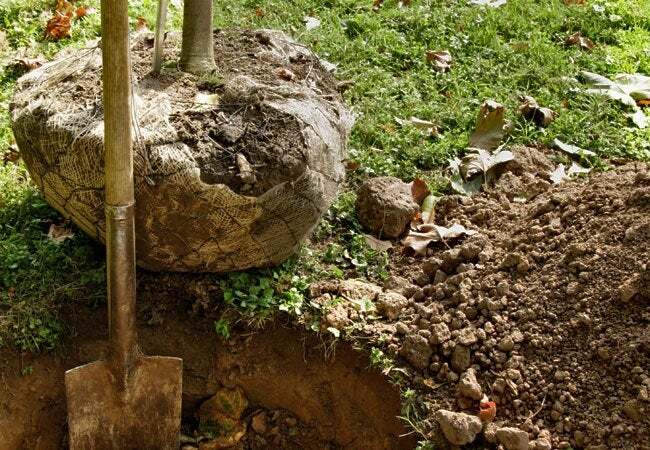 Remember that the diameter of the root ball as determined when pruning should be left intact; if a tree trunk is two inches in diameter, then dig a little more than two feet down in order to get the full root ball. Once the tree is completely free of the ground, place a sheet of natural burlap in the hole and coax the tree roots over it. Then lift the tree from the ground with the burlap (never by the trunk) to prevent breakage. Having another person on hand to help contain the tree roots in the burlap and lift the tree from the ground will help immensely. Secure the burlap together with twine to keep the soil together, and carry the tree to its new position. If it’s too heavy to carry, place its burlap-covered root ball on a tarp so you can drag it to the new location. Set the tree into the fresh hole, making sure that the base of the trunk will be level with the ground once the hole has been completely filled. Add any soil necessary to achieve the proper height. Once the tree is placed in the ground, remove the burlap and twine. Fill the ground around the tree with soil from the dug hole, making sure to keep the subsoil on the bottom and the topsoil on top. Tamp the soil down gently as you go. Water thoroughly, all the way out to the edge of the hole site. 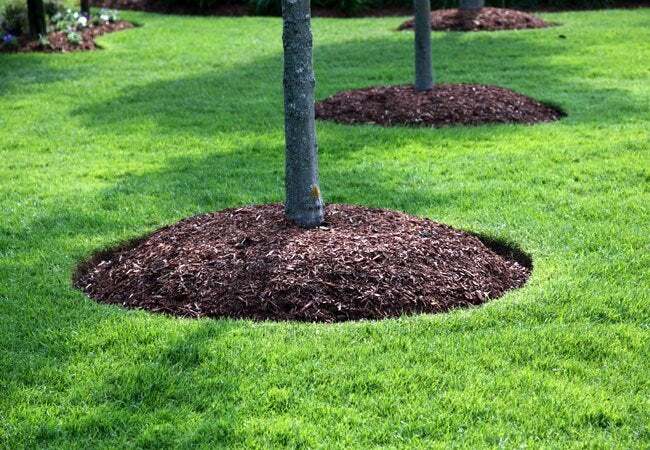 Then add two to three inches of mulch around the base of the tree, being careful not to push it up onto the trunk, to promote adequate moisture levels and temperature. The care you give a tree after transplanting is extremely important. If the tree is smaller, planted on flat terrain, and not exposed to a lot of wind, you shouldn’t need to stake it. The roots will actually grow deeper and stronger if you don’t. But consider staking unsteady or larger trees. After transplanting, ensure the tree gets enough water in relation to the climate, soil type, and rainfall levels. Generally, homeowners should plan to deeply water the tree every day for the first two weeks. Refrain from fertilizing the tree for at least one year; you want the tree to concentrate its energy on rebuilding its root system instead of producing new growth. With some planning and thoughtful care, you’ll be able to enjoy your transplanted tree in its new location for many years to come.